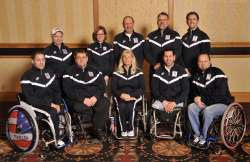 Team USA 2011 will be represented by the same five athletes that brought them so close to medals at the last Worlds and Vancouver Paralympics. Twelve athletes attended this weekend's open tryouts at the Green Bay CC in Wisconsin. While there is promising talent among those not selected, the downside to working with a small national squad is that they provide a receding target to a newcomer hoping to displace them. One trialist undaunted by the challenge, was Green Bay native Penny Greely. She told WBAY TV it was the degree of difficulty that drew her more to the game. "I'm a really competitive person so this was right up my alley when I started playing. I hope to remain part of the curling club, get on some leagues. And hopefully making the national team some day," she added. Watch an interview with Penny Greely HERE. Your observation is very accurate however I heard nothing from u when Team Canada Gold Medal winning skip gave an interview to a local TV outlet in the Vancouver area while sitting in a normal chair.... a bit of a "spit in your face" attitude to the rest of us. Check the archives of this site and u will find it....it was prior to the Paralympics. I don't recall Jim Armstrong or anyone else say he could not get out of a chair. Bruce, why do you continue to carry on like this? Eligiblity has been beaten up for three years now, and expect the eligibility requirements to loosen up over the next year. We NEED more players. I do have to agree with the previous blogger. I expect eligibility to be loosened up,with the view of adding to the numbers. Like it or not, it will happen. Perhaps then we can look at a points system for team eligibility.